The Marshmallow Roasting Sticks Campfire BBQ roasting fork with bamboo skewers tip keeps foods perfectly secure throughout roasting. This is necessary as part of your fire pit cooking accessories.We also added a FREE silicone basting brush to help take this outdoor event up a notch. Be sure to add this high quality smores sticks set to your cooking supplies for camping. Comes in a quality designed gift packaging. Perfect gift for every occasion. Get 8 of our campfire Smores roasting stick skewers + FREE 20, 12 inch bamboo Skewers + FREE Awesome Silicone BBQ basting brush + Camping and a FREE Canvas storage bag + FREE Ebook (Download from our site) ALL for one great low price. These extendable marshmallow roasting sticks is for the whole family to enjoy. Highly durable Stainless steel Marshmallow and bbq roasting skewers, very easy to clean and store safely in the FREE canvas pouch for the next outdoor event. A perfect addition to your outdoor cooking accessories and smores kit. Our quality marshmallow roasting sticks set /smores roastinfg sticks set with free bamboo skewers and its telescoping extendable design allows them to reach the campfire from up to 32 inches away, so you don’t have to get close to the fire to roast hot dogs or make smores. Quality skewers for marshmallows and good value sticks for smores. 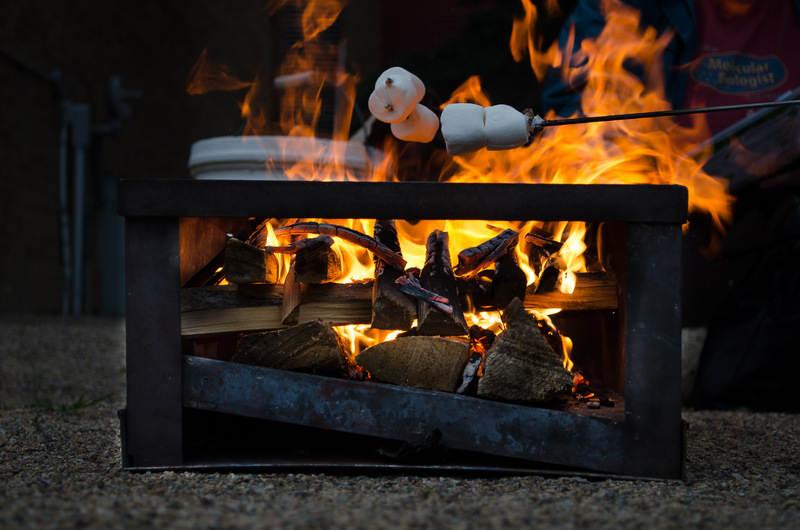 One of the best must have bonfire accessories, fully compliments every campfire cookware and an awesome addition to your bbq pit accessories. Our FDA Approved Campfire roasting sticks have extendable 32 inch length with all plastics being BPA FREE . These smores sticks and bamboo skewers makes an awesome bbq accessories for kids. The kids can use it a safe distance from the fire . family friendly and everyone will get a chance to enjoy the quality time and worry less about being too close the fire. We also give you a FREE durable canvas pouch to store your Marshmallow Roasting Sticks after the party is over. You get to easily supervise the Kids and Grandkids while they work on their smores safely away from the fire. These campfire bbq roasting forks easily work as Hot dog forks. We can’t have the kids have all the fun, Chances are you prepared the fire in the first place :). 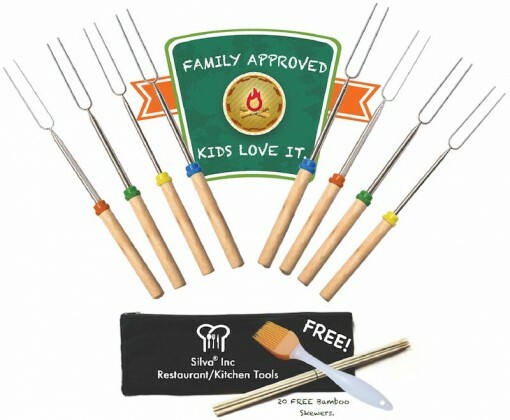 Gently roast your hot dog on these bbq roasting forks and sit back and enjoy the fun too. We highly recommend our awesome Portable Coffee/Spice Grinder that will make a perfect addition to your camping accessories. This is the Silva Standard. Reach out to us and get a reply in less than 60 minutes. We take customer service very seriously. If you’re not completely satisfied with our stainless steel marshmallow and BBQ roasting skewer set within 30 days, we’ll refund your money! ** Please Be Sure to Purchase from ” Silva Inc ” for all our benefits. We will reply all you email inquiries in less than 60 Minutes. 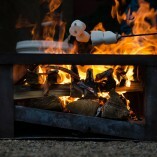 Click “Add to Cart ” now so you and the family can get to Safely enjoy making some awesome Smores.